We cannot accept returns of opened needle cartridge boxes due to safety reasons. Digital Hand needle cartridges are EO sterilized disposable needle cartridges. Hygienically prevents being injected during the procedure. All devices below use Digital Hand needle cartridges with adjustable needle depths. Before placing an order, please make sure the Digital Hand needle cartridge will fit your device. We cannot accept returns of opened needle cartridge boxes due to safety reasons. If you have any questions please CLICK HERE, we will be happy to assist you. There are countless imitation devices and needle cartridges on the market today. Many have copied our products down to the most minute detail. It is important that only genuine Bomtech devices and needle cartridges are used together. - Is the needle cartridge EO sterilized? If health inspectors come to your business, are you able to provide the proper certificates regarding sterilization? 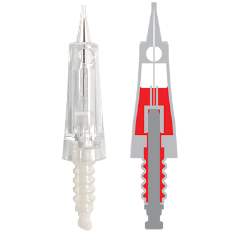 - Is the needle cartridge designed to prevent back flow contamination? Once fluid flows into the main body of the pen, the motor becomes corroded and will no longer operate to its highest capacity. - Other needle cartridges are not designed for Bomtech devices and will nullify Bomtech's safety design and damage the cartridge locking mechanism. It can result in a dangerous situation for both the person operating the device and the client. Over time, this will make placing on needle cartridges very difficult and may cause the cartridge to dislodge during use. 2. Open the app and select "Verify authenticity now"